Reflections of a Grady Doctor: Camp Papa Postcard Classics: Head 'n' Shoulders. Today is a beach day and PaPa got us some new swimming trunks but also with a swimming shirt. We went to the store with PaPa and this lady asked if we were twins. And I said, "No, I'm the big brother!" and she just kept on laughing but I don't know why 'cause I wasn't telling a joke. Mommy? Me and Zachy do NOT look like twins 'specially since I am a whole head taller. You know what? I think that lady was trying to flirt. Oh my. Your boys could not be any cuter. I am loving the vacation postcards so much. Thanks for the smile this morning. 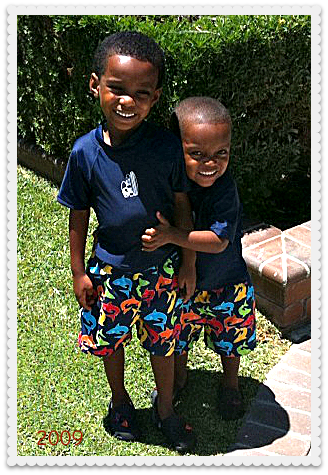 My boys had matching swim trunks way back when. Except this was in the 80s and they were day glo pink and green. Way cool. Thanks for the memories and the glimpses of your cute little boys. And their grandaddy isn't too bad lookin hisself! !